The state of Karnataka in India is the third most important state in terms of tourism. Karnataka has everything for everyone like Hill stations in Western Ghats, Forts, Historical places like Belur, Halebidu, Aihole, Badami and many more. The state is also famous for some of the important temples. There are thousands of temples in Karnataka it is difficult to give the details of all the temples. Here are the details of some of the historical and important temples of Karnataka. Other than the temples listed below one can also visit the splendid temples in Aihole, Pattadkal, Badami, Srirangapatna, Nanjungud and the Chamundeshwari temple near Mysore. Temple Timings: Open on all Days from 5am-8pm. 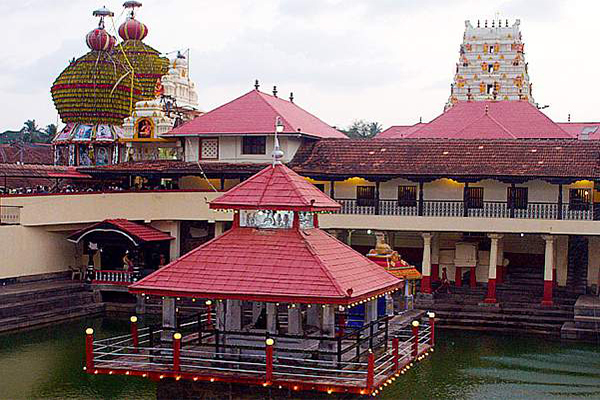 Kukke Subramanya is an important Hindu temple dedicated to Lord Subramanya son of Lord Shiva and Parvati. It is located in Subramanya village of Sullia Taluk in Dakshina Kannada district of Karnataka, India. 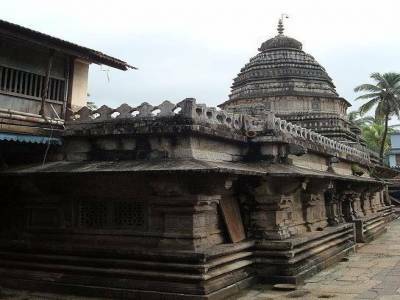 As the temple is located in Western Ghats one can get a perfect view of Kumara Paravatha from behind the temple. The temple is on the western slopes of the Ghats which is covered with dense evergreen forests. This holy temple is situated on the banks of river Dhara. The river originates in Kumara Parvatha mountain and further move towards western sea. The temple faces towards the east and the main entrance is at the back of the sanctum. Between the sanctum and the entrance lies the Garuda stamba (pillar) which is silver plated. It is believed that the pillar protects the pilgrims from the poisonous breath of Vasuki who is still residing in the caves of subramanya. The temple has a very interesting mythological history. It is believed that lord Subrmanya along with his brother visited this place after defeating Asura. The story goes on further. You can read more on the history from here. The temple offers different sevas to perform for the devotees. Some of the main sevas are Ashlesha Bali, Naga Prathista and Sarpa Dosha. Ghati Subramanya is located at Doddaballapur near Bangalore, Karnataka, India. It is 60 km from Bangalore and one can visit the temple in the morning and come back to Bangalore by evening. Ghati Subramanya is a temple dedicated to Lord Karthikeya or Subramanya and Lord Lakshmi Narasimha. It is believed that both the idols of Gods are self originated from earth (udhbhava in Kannada). The temple is open from morning 6am to 8:30 pm in the evening. Both Ghati subramanya temple and Kukke subramanya temple are quiet similar in performing all the sevas and the deity in the both the temples in Lord Subramanya. Here in Ghati Subramanya Lord Subramanya is in the form of a snake. Places around Ghati Subramanya: Tourists can also visit nearby places after having Darshan of Lord Subramanya and Lord Lakshmi Narasimha at Ghati. Some of the nearby places are the famous Nandi Hill station which is located at a distance of around 25 Km from Ghati Subramanya. Another temple which one can plan to visit is Devarayanadurga. The temple is dedicated to lord Narasimha. It is around 50 km from Ghati Subramanya. Situated at a distance of around 100 km Bannerghata National park can be you’re another important destination to visit. One can also rest in Bangalore for some time and later visit the park. It is a very beautiful park where tourists can see wild animals like tiger, lion, bear, elephants and many more. It is a very good place to spend good quality time. Look into some of the best Hotels in Mangalore. You can book your hotels in Mangalore and visit different places. Gokarna is an important Hindu pilgrimage place located in Karnataka, India. It is the one of the seven Hindu pilgrimage places standing tall with an elevation of 22m above sea level. Now the place is throng with tourists throughout the year for its temples and serene beaches. It is a small town in Kumta taluk of Uttara Kannada district of Karnataka. The place is beautified further with banana trees, coconut trees, blue sea and clean sands all over. The local language is Kannada but people do speak Konkani and English. This beautiful small town lies between Gangavali and Agnashini River. Since Gokarna is a small town the best way to known about the town is by walking around the small lanes of the town. The main temple is known as Mahabaleshwara temple which is dedicated to Lord Shiva and it is believed that the temple holds the Atmalinga. According to the history, Ravana got Atma Linga from Lord Shiva. Lord Shiva warned Ravana that if he keeps the Atma linga on the ground then it gets fixed to the ground and cannot be removed. Lord Vishnu with the help of Lord Ganesha tricked Ravana and kept the Atma linga on the ground in Gokarna. Mahabaleshwara temple: This temple is also known as Dakshina Kasi. The temple buzzes with tourists people during Maha Shivaratri festival. 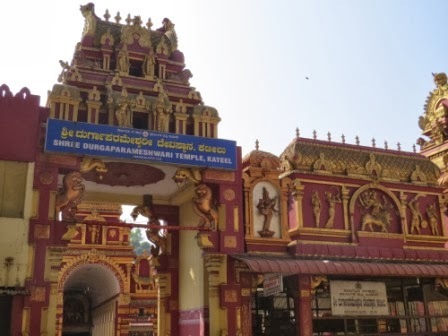 The temple is one of the most important pilgrimage centres in Karnataka other than Udupi, Kollur, Subramanya, Kumbasi, Koteshvara and Shankarnarayana. The temple is a very ancient temple and is mentioned in Ramayana and Mahabharata epics. The main deity is Lord Shiva and the temple is opened on all days from morning 5 am-12 noon and 5pm to 8pm. The temple is located on the west coast of Arabian sea near Karwar. The complex of the temple is very huge and ha many shrines in it. It is understood from the past history that the temple was first constructed by Mayursharma of Kadamba dynasty. Even Kalidasa mentions about Gokarna in his classical book of Raghuvamsha written in 4th century. The temple got upliftment during Vijayanagara Empire and further during 17th century Visvesvaraya of Halasunadu Kundapura built the Chandrashala and Nandi pavilions. Gokarna is both a pilgrimage place and Holiday destination. The place has many beautiful beaches, temples, coconut and banana trees along with blue sea make it a very important tourist’s destination in Karnataka India. Timings of the temple: morning 6:30am to 7pm. 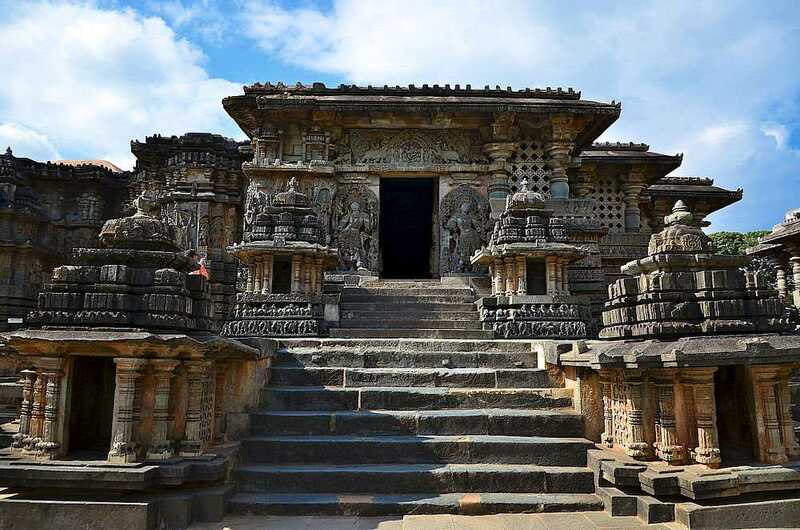 Another important and massive temple built by the Hoysala dynasty is the Hoysaleshwara temple in Halebidu. The massive temple was built by the Hoysala ruler King Vishnu Vardhan in 12th century in Halebidu which was a capital of Hoysala dynasty. The construction of this marvellous and magnificent temple was completed in 1160 CE. The temple is also known as Halebidu temple attracts thousands of tourists every year. The temple has two shrines one dedicated to Hoysaleshwara and Shantala Devi ( named after wife and queen of King Vishnuvardhan). The temple is facing towards east and has two Nandi Shrines in front of both the temples. Both the temples have Shiva linga inside the temple. The temple also has another important shrine dedicated to Sun God. 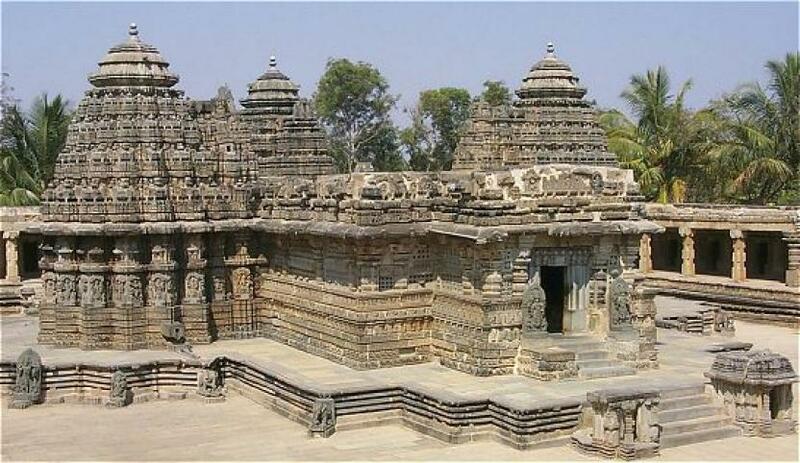 Hoysaleshwara temple has been beautifully carved and designed using soap stone. There are about 340 large images which depict about Hindu mythology of Ramayana, Mahabharata and Bhagvad purana. 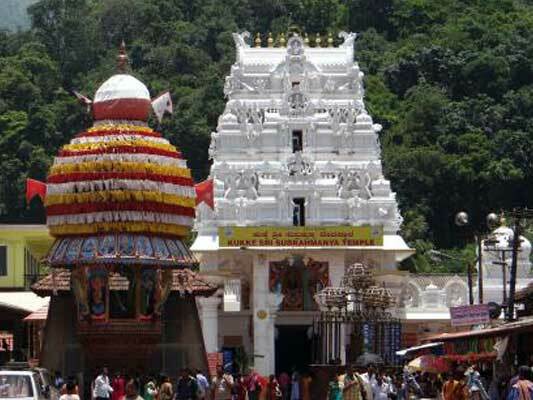 Dharmasthala is an important temple town located on the banks of River Netravati in Karnataka India. It is a very important pilgrimage place in Karnataka where thousands of tourists visit the place to take the blessings of lord Manjunath (lord Shiva). the temple is dedicated to lord Manjunath (lord Shiva), Ammanavaru and Thirtankara Chandraprabha. The temple also has idols of four guardians of Dharma namely Kalarahu, Kalarkayi, Kumara swamy and Kanyakumari. . Dharmasthala literally means the abode of Dharma. The temple can be visited throughout the year and the timings of the temple is morning 6:30am- 11am, 12:15pm-2:30 pm and 5pm-8:30pm. This temple is one of the most visited and important temple in South India. The temple is around 800 years old with an average daily visitors is around 10,000 people. The temple is built in Kerala style of architecture. The temple is built using wood, stone, granite and metals. The temple has a pyramidal roof structure with a square base. The roof is made from wood and is covered with gold plated copper plates to protect wood during monsoon season. The temple has a very interesting history you can read more about the temple here. Sri Veerendra Heggade is the present Dharmadikari of Dharmasthala. Mangalore is the nearest airport and railway station to Dharmasthala. There are many government and private buses from major cities of Karnataka. 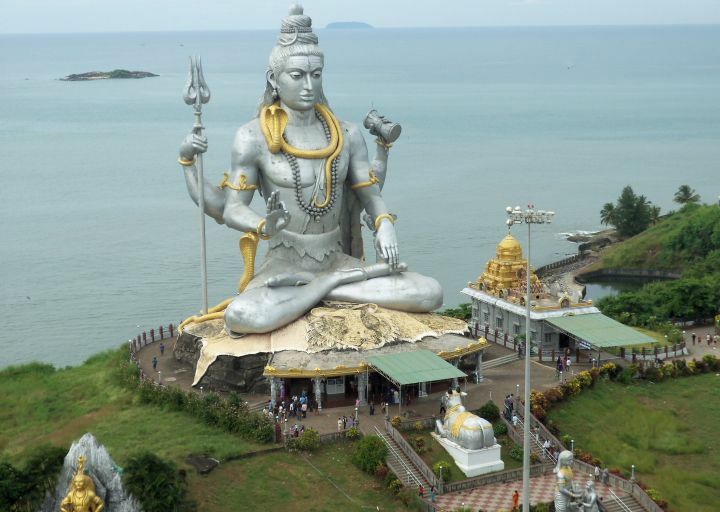 The world second tallest statue of Lord Shiva is present in Murudeshwara. This place is located in Bhatkal taluk of Uttara Kannada district of Karnataka, India. The temple is huge and unique and is dedicated to Lord Murudeshwara which is another form of Lord Shiva. The temple is surrounded by Arabian sea on three sides and the entrance of the temple has a huge 20 feet Gopuram. The Gopuram at the entrance is called as Raja Gopuram which means Kings of towers. The huge statue of Lord Shiva is magnificent and worth watching. To watch this beautiful statue of Lord Shiva and the Raja Gopuram the temple authorities have helped the visitors by installing the lifts. The temple is on a small hill by name Kanduka which is surrounded by three sides water by the Arabian sea thus giving a breathtaking view of the temple. The statue of lord Shiva is the second tallest statue after Kailashanth Mahadev statue in Nepal. The history of the temple is that of Gokarna. When Ravana threw the pieces of the Atma Linga in anger it is believed that the clothes of Atma linga fell in Murudeshwara. The temple is open on all days from 5:30 am to 1pm and again from 3pm to 8pm. 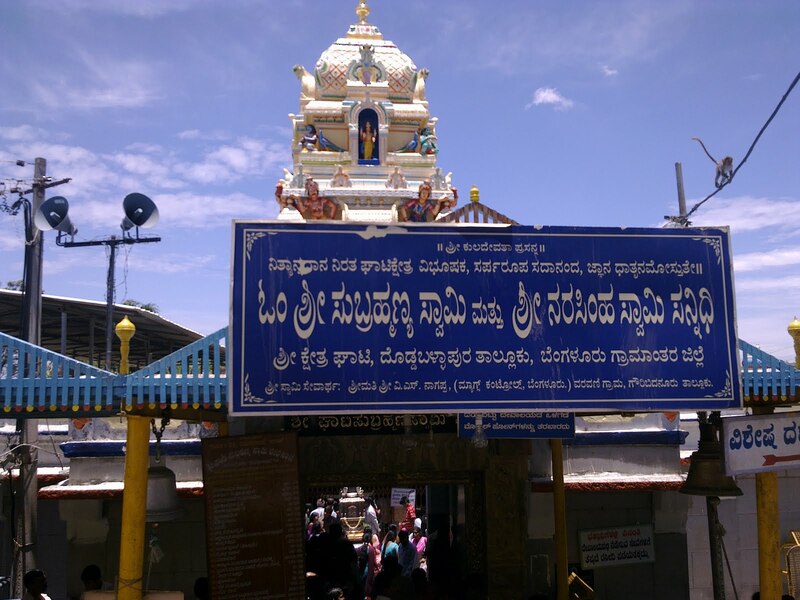 Kateel Durga Parameshwari temple: Another holy place in Karnataka India is Kateel. It is located in Dakshina Kannada district in Karnataka India. The place is around 30 km from Mangalore and the nearest airport and railway station is Mangalore. The place is also well connected through road. The place has famous and sacred Duragaparameshwari temple which is dedicated to Goddess Durga parameshwari also known as Bramhari. The temple is situated on a small island on the banks of river Nandini. Every day devotees are offered with free lunch and dinner. The architecture of the temple resembles the Kerala style of architecture. As one enters the temple after Gopura one can see a huge rock just before the bridge which was believed to b the rock of Raktheswari. Goddess Rakeshwari took the form of the bee to kill Arunasura. The rock is worshipped three times in a day. Other shrines that are present in the temple are of Mahaganapathi, Shasthara, kshetrapalaka, Nagasannidhi, Shrine of Brahma, and Goddess Chamundi. The temple is open on all from 4am to 10pm in the evening. 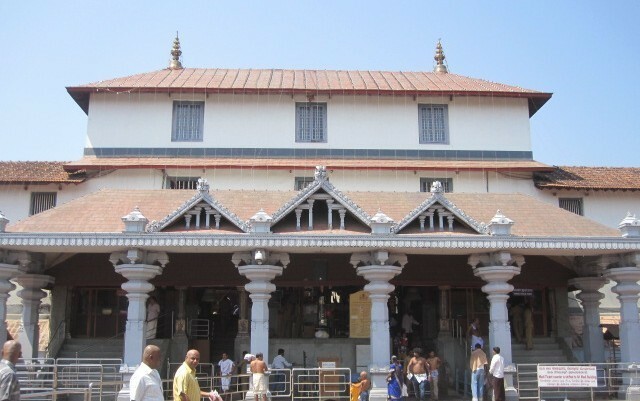 Udupi Krishna temple: Udupi is an important pilgrimage place for Hindus. Udupi Krishna Mutt is famous temple dedicated to lord Krishna. Krishna mutt is surrounded by several temples like that of Udupi Anantheshwara temple which is around 1,000 years old temple. Udupi is located in Udupi district of Karnataka, India. Udupi enjoys humid type of climate where it is hot in summers and pleasant during winters. The nearest airport to Udupi is Mangalore airport which is around 50 km from Udupi. The place is well connected through road there are many government and private buses operating from all the major places of Karnataka. The city is close to Malpe beach and also there are many temples to visit in Udupi. The main deity in the temple is of God Krishna in Childhood form. The temple is open from 5am in the morning till 9pm in the evening. Thousands of visitors visit the temple all year around to take the blessings of lord Krishna. The temple is world famous for its religious culture and traditions. The temple was built by the Vaishnavite saint Sri Madhvacharya in 13th century. It is believed that the idol of Lord Krishna was found in Gopichandana and later the idol of Lord Krishna was placed by Madhvacharya facing West. Darshan of the God is done only through Kanakana Kindi. There are eight Mutts in Krishna Mutt which is known as Astha Mutt (eight mutt). They are Pejavara, Puttige, Palimaru, Adamru, Sodhe, Kaniyooru, Shrur and Krishnapura Mutt. The temple management is changed for every two years when Paryaya takes places. Know more about these mutts and temples by clicking the link.